"There is no impossible. There is no unbelievable," 2013 Morehouse valedictorian Betsegaw Tadele said during his speech. 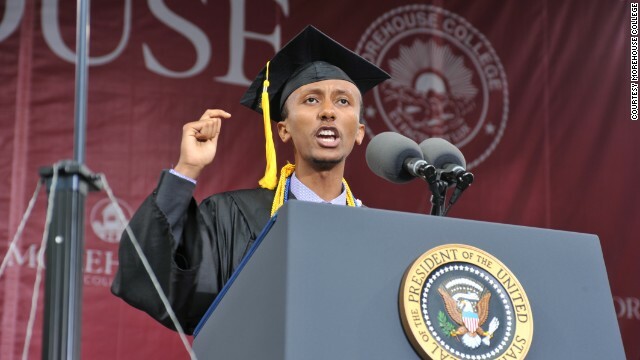 (CNN) - On a rainy afternoon this spring when President Barack Obama gave the commencement speech at Morehouse College in Atlanta, he called valedictorian Betsegaw Tadele the “skinny guy with a funny name” – a nickname Obama has often called himself. Tadele’s journey to sharing a stage with the president began in Addis Ababa, Ethiopia, the youngest of Tadele Alemu and Almaz Ayalew’s two children. Tadele’s first name, Betsegaw, means "by God's grace" in Amharic, his native language. In the summer of 2009, Tadele came to the United States in pursuit of a higher education. Morehouse College, a historically black college, was not Tadele’s first choice; he was initially interested in more technical schools. Morehouse only awarded him enough scholarship funds to pay for tuition, not room and board. But Tadele’s brother happened to be living and working in Atlanta. Tadele saw this as an opportunity to spend time with his brother while taking advantage of what the university had to offer. Morehouse became his new destination. After four years at Morehouse, Tadele had a 3.99 GPA. He graduated with a degree in computer science and a minor in mathematics. He won departmental awards in math and the school’s computer science leadership and scholarship award, led Morehouse’s Computer Science Club and is a member of Phi Beta Kappa. "There is no impossible. There is no unbelievable. There is no unachievable, if you have the audacity to hope," Tadele said during his speech, paraphrasing the name of the president's 2006 book, "The Audacity of Hope." 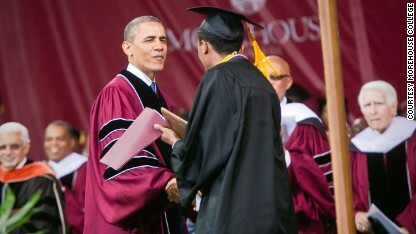 President Obama and Betsegaw Tadele speak at the Morehouse graduation. The next stop in Tadele’s journey is Seattle, where he'll work for Microsoft. CNN: First thing first, what was it like to meet President Obama? Betsegaw Tadele: I didn’t really get to meet him except on stage. There were a lot of Secret Service (agents) around him. Many were suggesting I go and hug him, but I couldn’t do that. But it was great; after my speech, he got up gave me a hug and told me he was proud of me. That was a great honor. CNN: What was the greatest part of being a Morehouse valedictorian? Tadele: It was great to be able to mark that moment and summarize our journey at Morehouse. I wasn't nervous at all. I could feel the energy of the crowd, everyone was happy to be there. It was an honor to be able to acknowledge all these parents who sacrificed so much for their kids to be there. Acknowledging them and our hard work and the energy of that moment was unforgettable.